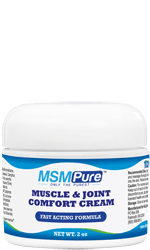 MSMPure™ is a premium supplement compound that supports healthy joints and mobility. The genius of MSMPure™ is that the products are fortified with sulfur— the fourth most abundant mineral in the human body. Sulfur is important for the maintenance of healthy joints, tendons, ligaments and other connective tissue. Active adults look for science-based products that work! MSMPure™ makes any physical activity less strenuous and helps people recover quicker from injuries, strains and the like—all so they can get on with their life. MSM benefits overall joint function and range of motion to stay active and away from injury. MSM helps maintain healthy cartilage between the joints for better mobility and locked-in comfort. MSM helps prevent chronic joint issues by decreasing swelling, inflammation, and stress recovery time so you have more battery life. Time takes its toll on joints, causing more frequent pain and soreness. MSMPure™ helps with short term recovery by reducing inflammation and swelling associated with joint pain and fatigue. Staying active and on the move is important in maintaining a healthy lifestyle. But the body, especially the joints, take longer to recover from physical exertion the older we become. MSMPure™ helps reduce the effects of aging in joints so you can stay mobile and independent for a longer period of time, no matter your age. Dietary sulfur is crucial for the development and maintenance of the joints and cartilage. MSMPure™ delivers sulfur through supplements that are easily digestible for fast and efficient absorption into the body to maximize your nutritional health.